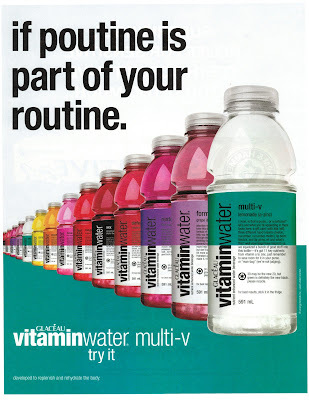 Weighty Matters: Badvertising: vitaminwater healthifies poutine! So just a few kilometres South, Coca Cola's vitaminwater is in the midst of lawsuit that aims to prove that vitaminwater's labeling is deceptive and falsely confers the notion that it's healthy for you. "if poutine is part of your routine"
(where poutine is a distinctly Canadian concoction of french fries covered in cheese curds, smothered in gravy) suggests that miraculously sugar water with a few scant vitamins will negate the risks of an unhealthy diet, still litter our magazines. Here's an alternate way to interpret the ad. Perhaps Coca Cola's practicing honesty in advertisement whereby the ad is meant to explain how only folks so nutritionally ill-informed or unconcerned that they routinely consume poutine would also routinely consume vitaminwater?